Like the best boutique amps, the Royal Blue OD lets you determine the amount of breakup by how hard you strike the strings with your pick, and/or by adjusting the volume knob on your guitar. 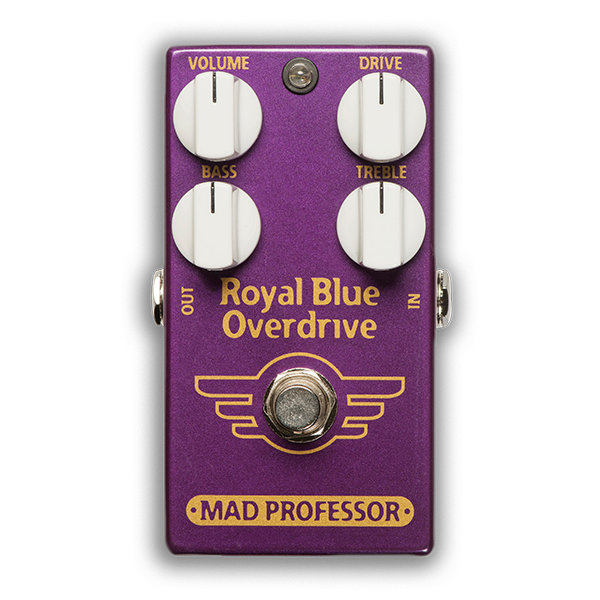 The Royal Blue can add this level of expressiveness to any clean or slightly overdriven amplifier. CONTROLS VOLUME: Sets the overall output level of the pedal. DISTORTION: controls distortion, for most dynamic response set where the amount of distortion is controllable with picking force. TREBLE: A boost/cut “shelving” type equalizer that controls the amount of high-end, operating where the Presence control is on most amplifiers. Treble can be used to add shimmer to even bright amplifiers without interfering with a typical treble boost of most amplifiers. BASS: A boost/cut shelving type equalizer that controls the low end, just above resonance of a standard 4×12 cabinet. With both Bass and Treble turned up, you can get a scooped heavy tone; turn the knobs down for soft mid-boost tone. SETTINGS For Midboost: set Treble and Bass fully CCW. For Midcut: set Treble and Bass fully CW. ELECTRICAL SPECIFICATIONS Current draw: 3.5mA at 9V DC Input impedance: 140K Output impedance: 25K Voltage range: 7.5-12V’s POWER REQUIREMENTS 6F22 9V battery or DC eliminator 2.1 mm plug center negative and positive sleeve.